Looking for something to do on a grey-day afternoon? 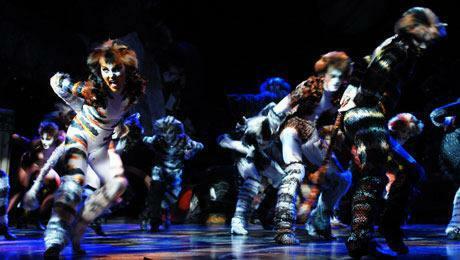 I've just been to see the superb West End production of Andrew Lloyd Webber and Tim Rice's acclaimed show 'CATS'. What can you say about a show that has been lauded the world over for more than three decades that hasn't been said before? As with most people, seeing an amazing production of musical theatre is a very personal thing and all I can say is that I admired the athleticism of the dancing from the start with the choreography completely encapsulating the stealth and sleekness in the art of being feline, while the beautiful voices of the lead singers and the backing of the theatre company made this a magical experience. The main point, however, is that I didn't have to travel to London to see the show; I saw it at the Sunderland Empire in the north east of England. The theatre prides itself on bringing good quality shows to the region and this was no exception, the West End show was on tour and it brought its magic with it. My friend and I don't often visit the theatre but we have also recently seen 'Dirty Dancing' and we are looking forward to other productions coming to the area. It looks like the summer season is going to be packed with music, laughter and cultural shows that will suit all tastes. Thurs 20 June 2013 Tickets at £27.40 £2.85 transaction fee. 6 July 2013 Tickets £29.90 £2.85 transaction fee. The Sunderland Empire dates back to 1907, when it was officially opened by music hall artist Vesta Tilley, and has been at the heart of entertainment on Wearside ever since. Refurbished in 2004, it has a seating capacity of 1860 over three tiers which can be accessed by lift. Refreshments are served at bars throughout the theatre. The city centre theatre is easily reached by car or public transport as the Metro station and Park Lane bus concourse are less than a ten minute walk away, while network rail services are available from the main railway station in the city centre. And if you want to do a spot of retail therapy, the 'Bridges' shopping centre is 2 minutes away. As it was Wednesday, we went to a matinee performance after booking the tickets by telephone and collecting them at the box office on arrival. You can book online at the Sunderland Empire website, which uses the ATGTickets booking system. There are a range of discounts for group bookings, regular theatre goers and discounts for disabled people. If you need assistance with booking there is a dedicated telephone number where you can talk to a member of staff who will help you through the booking process and suggest seating options. 'CATS' runs until 8th June 2013 and has both evening and afternoon shows, so check out the website, but hurry because it is selling fast. Tickets for the show range from £12.90 - £46.40 a transaction fee of £2.85. Please be aware that you might incur booking fees and charges for using your debit/credit card.